Baobab Collection stays true to its value of craftmanship and excellence by supporting European expertise. Our raw materials are selected with greatest care. All our candles are hand-poured into glass that is hand-blown by master craftmen. country recognized for its creativity, know-how and minimalist chic. cultivated in the pacific islands for many centuries. The latest collections, each as prestigious and refined as the previous, transport you to new destinations. that becomes extraordinary. This is probably what defines luxury. 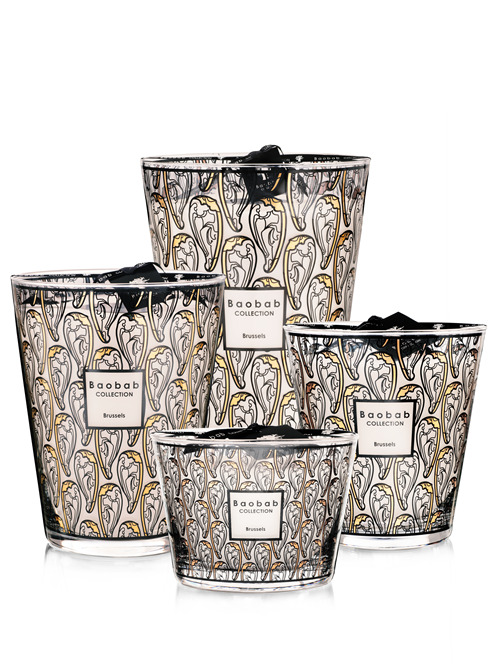 Baobab Collection kicks off the fall with a vow to continue its action to support breast cancer research by releasing a new candle to accompany our Women candle: the Gentlemen candle as the new face of Pink October, a month dedicated to this noble cause. This winter, our limited edition will be the Stones collection, an ode to beautiful gems and excep-tional women. This collection is illustrated through a family narrative, where our three candles appear through the powerful names Marble, Agate, and Lazuli: the Stones sisters. Finally, we celebrate Brussels with two candles with prints that reference Horta’s iconic architec-ture. It is therefore in Brussels that the Stones sisters will spend Christmas, lit by the “Christmas in Brussels” candle, an enchanting and twinkling holiday season bathed in red light, as if shining through a stained glass window. 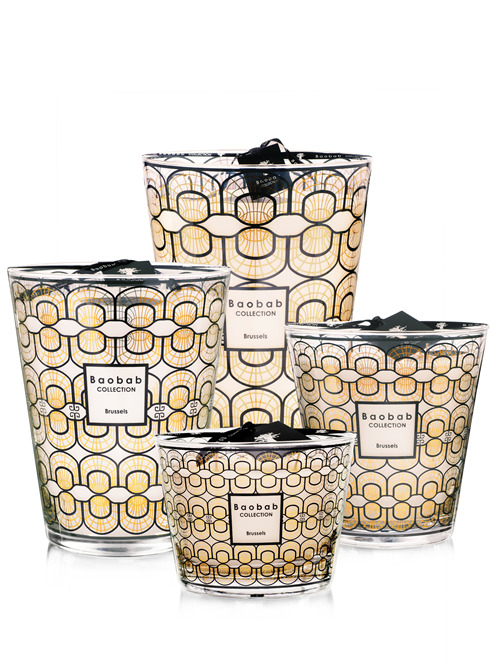 Baobab Collection renews its decision to support the BIG foundation, and its breast cancer research, along with Pink October with a new candle and diffuser titled Gentlemen. What would women do without men and how can we celebrate the men we love and who love us? Printed with a graphic motif that symbolizes the feminine, we chose the subtle hues of a masculine wardrobe: navy blue with a platinum rim. Its perfume combines notes of rum and saffron, a blend that can only belong to an elegant man, simultaneously seductive and refined. This candle’s classic but precious allure will easily fit into any interior as a new decorative object. We hope that the Gentlemen candle will be as well received as the Women candle, a reminder of how important it is to continue fighting for a cause that we believe in. 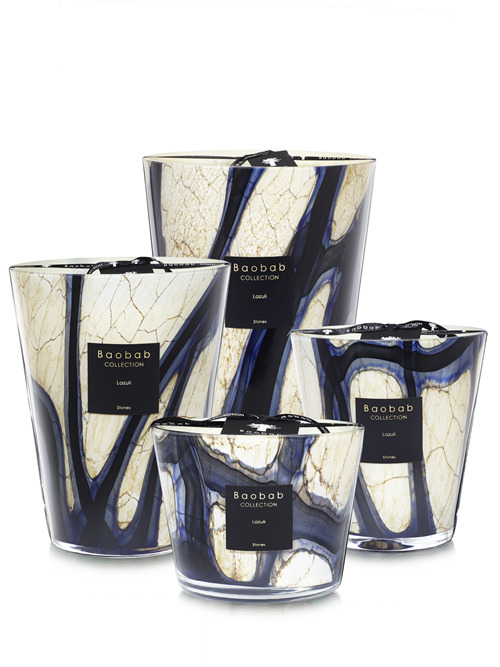 Baobab Collection calls upon new artisans and their unparalleled mastery of hand-blown glass for its Fall-Winter 2018 limited edition collection. Each color is slowly inserted into the glass as it is blown to create a material that is both opaque and transparent, similar to hard stones like marble, lapis-lazuli, and agate. Elegant and sophisticated, the Stones collection reveals a new decorative style. 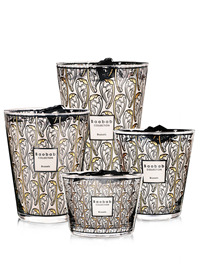 More than ever, these three scented candles become precious objects of decor. In order to instill this collection with a creative narrative, we have decided to depict the Stones as a sisterhood where each woman unveils her personality through a different scent. We asked the French artist Tiven to illustrate the Stones collection with amazing paintings representing the three sisters: Marble, Agate and Lazuli. Two candles, inspired by Victor Horta’s iconic architecture, have been created to illustrate the city of Brussels. Victor Horta, a Belgian architect (1861-1947,) is considered to be one of the pioneers of Art Nouveau architecture. He designed the face of Brussels with an instantaneously recognizable architecture, through which he expressed his fascination for curved lines, light, and steel. This collection pays homage to Horta’s legacy of vaulted balconies, as the Brussels Art Nouveau candle. For the Art Deco candle, available exclusively in one department store by country, we were inspired by a more graphic window design, caracteristic of the art deco movement. As a Madeleine de Proust, the Brussels Art Nouveau and Brussels Art Deco perfume conjures up visions of bourgeois homes of the late 19th century. With a sophisticated blend of wax, honey, cypress, and sandalwood, memories resurface as they tell tales of the warm interiors and woody scents of child-hood homes. The scented candle is set in a hand blown glass replicating grey marble with black strokes edged with beige. The elegance of the glass reveals the flame, giving an effect of a lumi-nous stone. 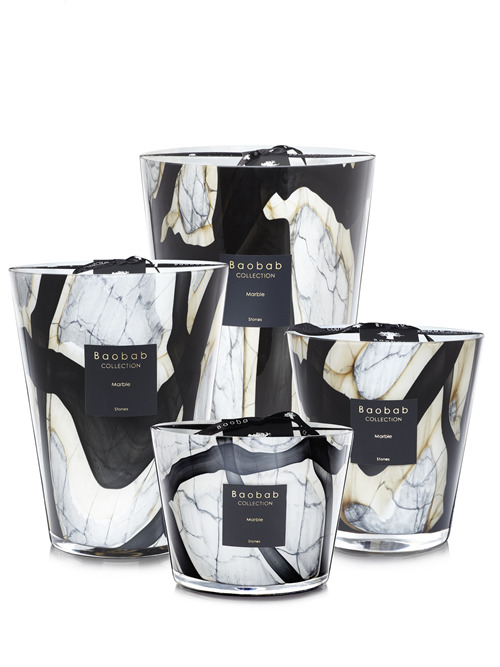 Its scent is a mysterious blend of leather and tuberose perfectly embodying the dual personality of Marble Stones, both feminine and masculine. The scented candle is a timeless piece of sophistication and elegance. Its marbled glass with intense blue effects perfectly illustrates the amazing personality of Lazuli Stones. Its fragrance, with the scent of sea salt and musk, will transport you to the banks of Tanzania where blue stones rein as absolute goddesses.